1. What is a Card Token? The card tokens allow you to block cards or additionally mark them with a certain label for categorization. The card tokens panel is available on the Board sidebar to the right of each board interface (img.1). From this panel, you can create and customize blockers and stickers according to your specific use-cases, the field of operation and teams. Only Workspace Managers and Account Owners can create and manage Card tokens. There are two types of card tokens Blockers and Stickers. You can use blocker tokens to block cards according to the specific blocker case that you have defined. Create multiple blocker tokens to make the blocked reasons explicit and to categorize your problematic tasks. Adding blocker tokens makes blocked tasks outstand on the board and helps you minimize your points of failure. 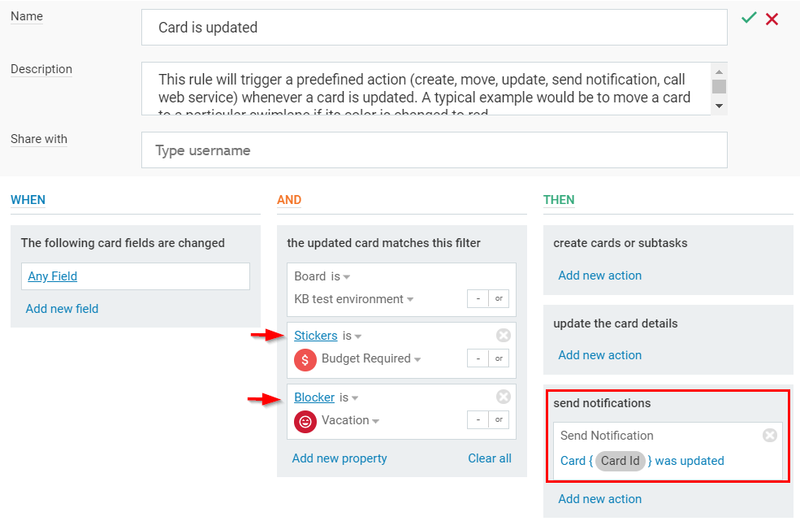 Blocking a card is as simple as a drag and drop of the blocker to the selected card. 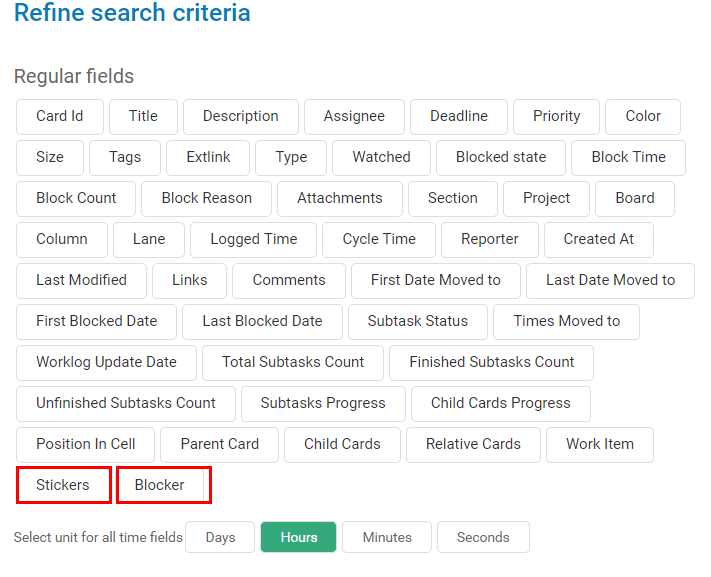 All blocked cards accumulate block time that is added to the standard and premium analytics modules in Kanbanize. Sticker tokens are used in a way very similar to blocker tokens but serve a different purpose. You can use them to mark a task with any label you have created and categorize the cards outside the scope of blockers. Stickers actually complete the token functionality by allowing you to categorize use cases that are important to your workflows and visualize them on the board. Note: You can simultaneously block a card and label it with a sticker. 2. How to Create and Manage a Blocker Token? 2.1 To create a new blocker -> click on the "New blocker" icon -> select Create New. 2.2 Customize your blocker from the New Card Token Panel -> select a color, attach an icon from the gallery and define a name to create it. All created blockers will be stored as a list in the dedicated blockers area of the panel. - To be able to add blockers to your cards, you need to assign them to the boards first. Use the arrow to open the dropdown list and checkmark the boards to add the blocker. - if you checkmark "Available globally across all board" - аll PMs will be able to see and add the blockers to their boards. –if you checkmark "Apply automatically to new boards" - the blockers will be added to all new boards that you create as a PM. NB: if both options are selected the token will be automatically added to every new board in the account. 2.3 How to Apply a blocker to the card? 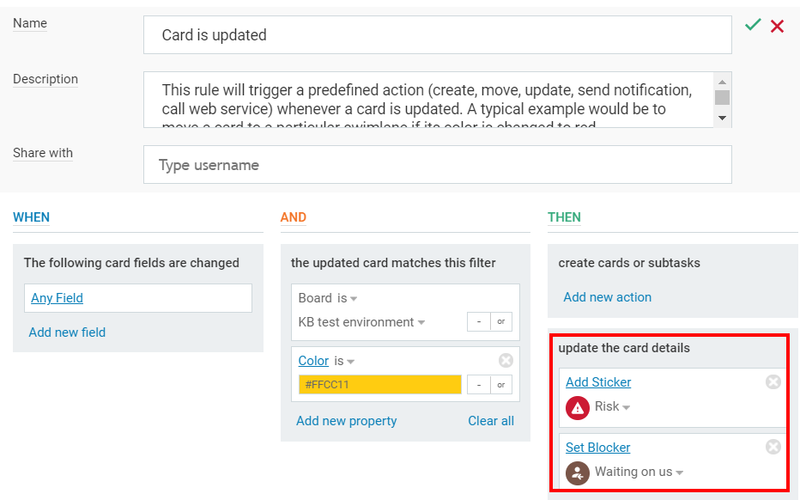 To block a card on your board, open the Tokens panel from the sidebar -> drag and drop the selected blocker to the card. The card will be instantly labeled with the color and the icon of the respective blocker token and will become immovable until its resolution. If you open the card, the blocker will become visible at the upper left corner of the card. To unblock a card -> right click on it and select: unblock. 2.4 How to edit/remove a blocker? Right-click on the blocker to edit it or remove it from the corresponding blocker list of the board. If you remove a blocker from the board it will be removed from all visible and archived cards on the board. To permanently delete a token -> go to the Administration panel -> select the Card Tokens tab. 3. How to create and manage a sticker? 3.1 Stickers are created and managed in the same way as blockers (use the same navigation). They are located and stored in the lower part of the Token Panel. Use the Create New button to open the New card Token panel. 3.2 To create and customize your stickers -> select a color, attach an icon from the gallery and define a name. Don't forget to assign the stickers to the boards in order to make them present in the corresponding card token panels. 3.3 Right-click on the sticker to remove or edit it. To permanently delete a sticker token -> go to the Administration panel -> select the Card Tokens tab. 3.2 How to Apply a sticker to a card? To label a card on your board, open the Tokens panel from the sidebar -> drag and drop the selected sticker to the card. The card will be instantly labeled with the icon of the respective sticker token. If you open the card, the sticker will become visible at the upper right corner of the card. To remove a sticker from the card -> right click on it -> select: Remove from card. You can label a card with more than one stickers. The Blocker and Sticker tokens are available as capability in a variety of product areas. The tokens are now integrated components in the business rules filters and triggers. - There is an extra option in the rules configuration, which allows you to select if you want to apply the sticker once or every time when a certain event occurs. - You can apply an unlimited number of stickers, but for a better distinctness, the first 20 stickers will be visible on the card. The "Blocker" and "Stickers" tokens are added as criteria in the Advanced Search panel. If you run a report and further configure your search to display Stickers and Blockers, you will be able to see all tokens applied to the cards, displayed in a separate column.